Nearly each archer in Korea starts his set-up position like shown in the shot sequence gallery on the website, where the draw hand is at the height of the nose. Here in Germany we show the new archers that the draw hand must be about 10cm lower and in one line with the chin, so that the new archer has do draw in one line - and the archer in Korea has to draw "from the top"
Why you prefer this way "from the top"? The high draw, must be somewhere between eye and shoulder level. The reason for this is to keep the drawing forces above the front shoulder joint so that all the muscle action developed during drawing will be directed downward. 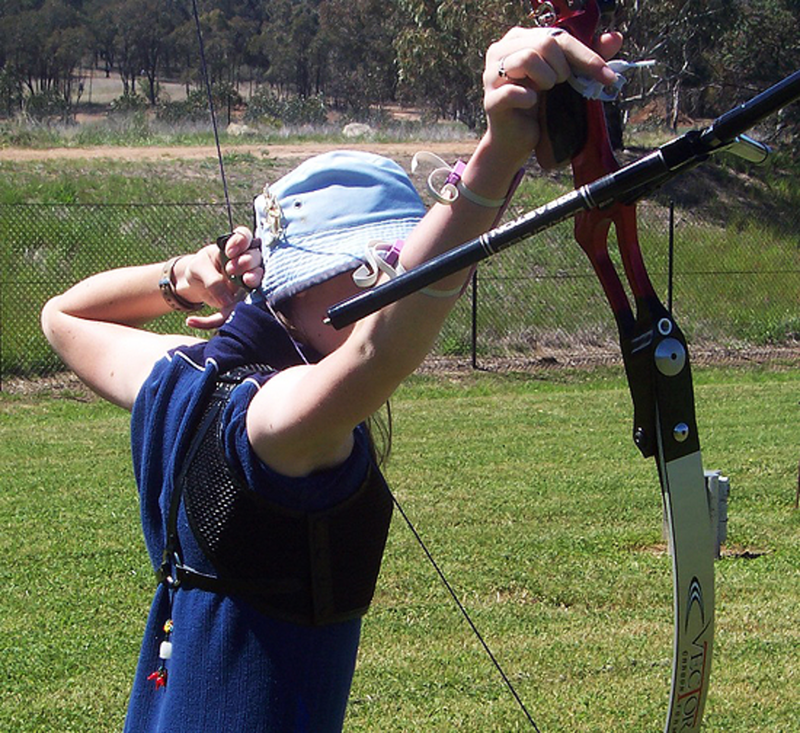 Especially when the bow draw weight increases the forces must be directed downward, to keep the draw shoulder down, without having to recruit any shoulder muscles to keep the shoulder down. As the drawing shoulder has been set down already, prior to the drawing, the downward forces compliment the shoulder muscles as they are all acting in the same direction. Now if a low draw, as you suggest, is employed, the draw forces will remain below the shoulder level, trying to force the bow shoulder up, whilst the muscles of the shoulder are trying to keep the shoulder down. As such you will get antagonism between two opposing muscle groups. Have a look at the photo under SPT-4. Now if you get archers to draw behind their back like this they will get the feel of how the shoulders should be positioned. Also they will feel the muscle groups which are involved.